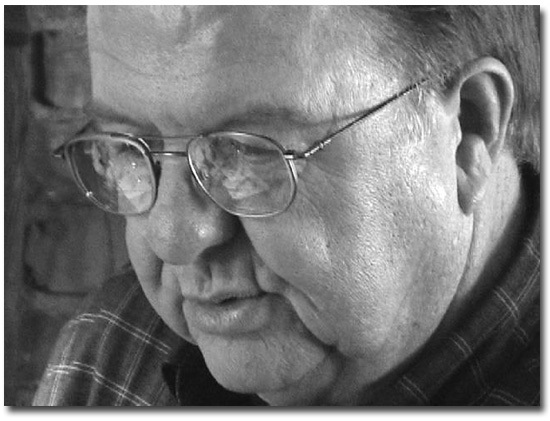 I first met Chuck French in my church, the First Methodist Church of Gilford, New Hampshire, where he had a reputation of being one of the best fly fishermen for landlocked salmon in the church. We have grown to know and respect each other. One morning at church I heard him tell, with intense reverence, that there was "… a rainbow trout in the Town of Gilford under the main bridge into town which would go at least 3 pounds!" This is the kind of information which gets the attention of every decent angler. I later heard about his son catching 6 to 7-pound largemouth bass around the docks at Fay's Marina in Gilford, New Hampshire, where I dock my boat. Word around the church was that, even when he was a school administrator, he would be out on the trout ponds, streams, and Lake Winni catching an hour or so of fly-fishing before school would open. He is one of those meticulous anglers who ties flies, prepares all winter for April 1st Opening Day, and passes on his love of angling for landlocked salmon to his children and grand children. I was born on May 18, 1938 in New Boston, New Hampshire and graduated from New Boston High School in 1956. I completed a B.S. 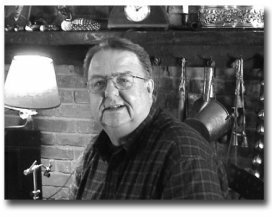 degree in Forest Management at the University of New Hampshire in 1961 and a Masters Degree in School Administration at Plymouth State College. I married Barbara Kane of New Boston in 1960. I served in the Army as an artillery officer in the 2nd Armored Division from 1961-1963 and in the 368th Engineer Battalion, an Army Reserve unit in Laconia, for 5 years. I began a teaching career in 1963, at Memorial Junior High School in Laconia, New Hampshire. 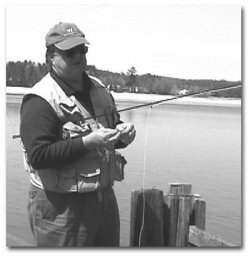 I was a school administrator (Vice Principal in Laconia from 1967-1974).I served as President of Trout Unlimited, Winnipesaukee Chapter and I’m a former registered Fishing Guide in the State of New Hampshire. I have 4 daughters, 1 son, and 15 grandchildren who are learning from me how to fish. I've been fishing Lake Winni for 40 years, beginning when I was 27. 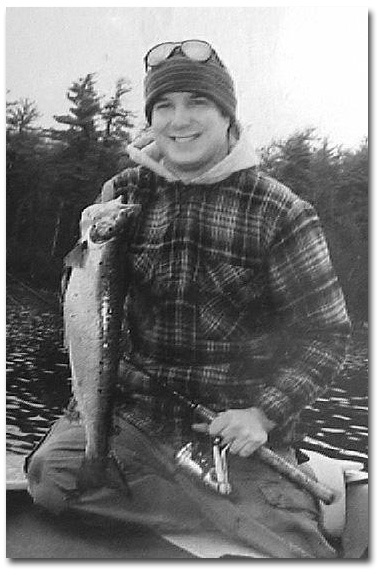 My father-in-law, Howard Kane introduced me to landlocked salmon fishing on Lake Winnipesaukee in New Hampshire in 1965. He had many years of landlocked salmon fishing under his belt, especially on Winnipesaukee, and also on Lake Moosehead in Maine. He used, almost exclusively, tandem flies such as the "Gray Ghost," "the Pine River," and the "Nine-Three." Every so often he would even put out a hardware lure, and usually it was the "Pearl Wobbler." or a version of the "Mooselook Warbler". I always looked forward to being out on the water with "Howie" as we attempted to track down landlocked salmon in his pampered 19-foot Thompson lapstrake. I have a second person that must be considered my fishing mentor. My good friend and professional colleague, Marty Harwood is the one who has been most influential in cultivating my fondness for the sport of fly-fishing. This influence continues today as a result of sharing many fishing trips taken all over the states of New Hampshire and Maine. Both "Howie" and "Marty" have taught me countless things about fishing, including landlocked salmon, but I have gained much more than just angling techniques from each of them. These two men, each in their own way, have been a very positive influence in my life, and they have done this mainly through teaching by example. By observing their actions, I have learned how to prepare for, and carry out, successful fishing excursions for landlocked salmon and other fish; but more importantly I have learned to have a deep respect and reverence for the lake, the fish, and all the other natural surroundings when out on the water. 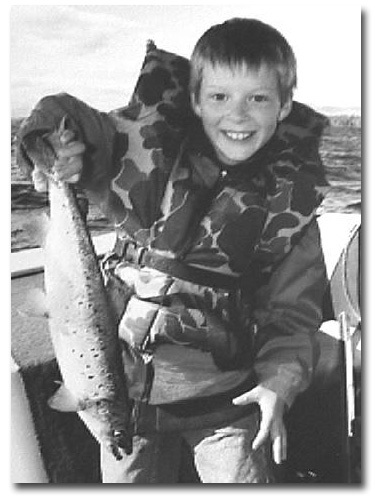 The landlocked salmon is definitely my favorite Winnipesaukee game fish. A hooked landlock salmon has fighting characteristics that are legendary, known for its strong runs and its tail-walking abilities. I must admit, however, that a nice 3-pound rainbow can give a good account of itself too. I would describe the landlocked salmon as a handsome species. Its overall shape, silvery scales, and unique markings make for a creature that is something to behold. Which do I prefer, lead core, fly rod, or down rigger fishing for landlocked salmon and trout? My strong preference for landlocked salmon tackle for trolling is a 9 foot fly rod, a Pflueger Medalist Reel, a #7 or #8 sinking fly line, and a 12 foot/6-pound test leader. I use a seventeen-foot fiberglass fishing boat but I don't own any down riggers. I ordinarily put out three trolling lines when accompanied by another fishing companion. Each fly rod is secured in a Downeaster rod holder. I have only used lead core line on a few occasions, and that was several years ago. The deadening effect of lead core line on the fish's jumping ability is the main reason I don't use it anymore. By fishing a sinking fly line, the fly or lure ordinarily travels through the water at approximately one to two feet deep, depending on the trolling speed. The landlocked salmon are feeding on top, where the smelt population is running. The anticipation level is way up there after a long winter's wait. I like the cold, rough lake weather in the spring. There are fewer recreational boaters to watch out for. The very early morning hours are my definite preference for landlocked salmon fishing. I'm an early riser and I love that time of day. Often the landlocked salmon are chasing smelt right on the surface well before the sunrise. Late afternoon is my second choice. However, I have had some great success fishing right in the middle of the day too. I like to vary the trolling speed periodically until I find the one that seems the best for the conditions of that particular day. Landlocked salmon don't seem to have any difficulty hitting a fairly fast moving fly. Note: During May, June, September and October much of my fishing time is spent on small fly-fishing ponds in New Hampshire and Maine with the Eastern Brook Trout as the quarry. Largest Salmon, Laker, Rainbow, bass and other fish I have caught? Size: 6 pounds in May 1972. Cusk: I've caught 3 and 4 lb. cusk. The 6-pound landlocked salmon that I caught back in 1972 was memorable because of the horrendous weather conditions we had to contend with. A fishing friend and I foolishly decided to venture out on to Lake Winnipesaukee, New Hampshire in my 12-foot aluminum boat one very cold and blustery day in May. The fish struck while we were trolling off the south side of Timber Island. I played the fish for nearly twenty minutes and, as a result, we drifted out from the leeward side of the island and into very rough water. We were lucky to land a landlocked salmon of that size in such unfriendly conditions; but more importantly, we were lucky to make it safely back to shore and be able to show off our prize fish to the folks at home. Passing on to others my angling skills for landlocked salmon? One of the biggest sources of enjoyment for me as a fisherman is derived from helping others learn the skills involved with fishing, especially the skills of fly fishing and also fly tying. Because of this my wife, Barbara, plus our four daughters and one son have all found success as anglers. Now I'm able to introduce several of our fifteen grandchildren to the world of fishing. 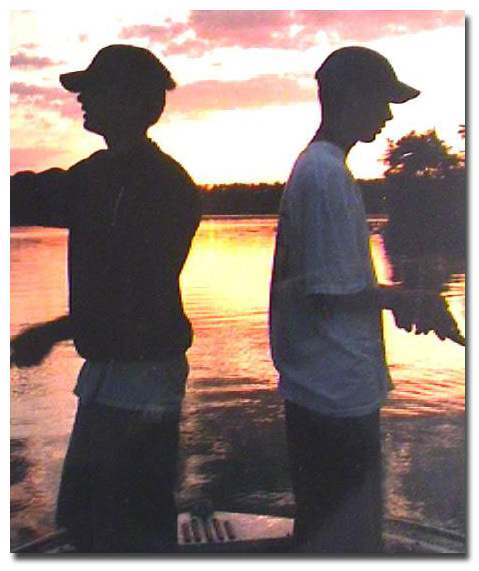 I've also helped two of our son-in-laws become very adept fly fishermen. 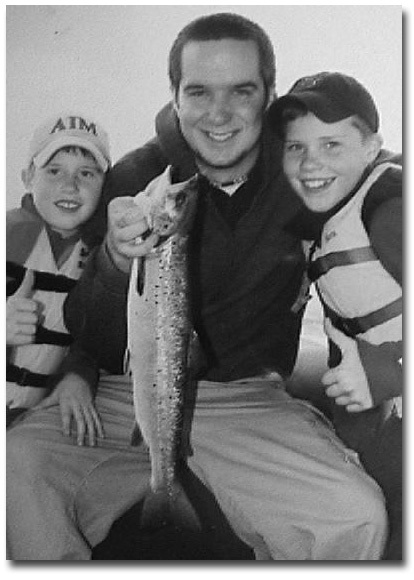 Fishing trips have been a way of life in our family for more than forty years now. There is an abundance of family photographs on our refrigerator and in our photo albums showing off the big landlocked salmon that "didn't" get away. Keep all fishing equipment organized and in tip-top shape. Go to bed early, get up early, and get out on the water early. If the salmon are surfacing early in the day, try fly casting to them with a #6 Maynard's Marvel. When trolling a sinking fly line be sure to put the entire fly line in the water for better action of the fly as it move's through the water. Try float fishing with a live pin smelt that is allowed to swim freely as far away from the boat as possible. Always cut your motor as soon as possible following the strike so that you can fight a fish that has retained maximum stored up energy. Maintain and organize your equipment. Get out on the water real early in the morning. Try using a portable bob house for greater mobility. Maintain a "packing list" of the equipment you need for ice fishing. Fish at a variety of depths until you determine the optimum level. Be sure to try jigging with varying sizes of the Swedish Pimple. Fish early in the day, and late in the evening. 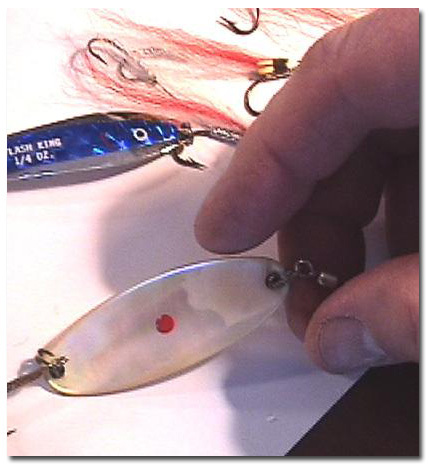 Try the "Red & White" tandem and different versions of the Flash King lure. Rainbows can become very active on the surface during a good chop. Try stopping, drifting, and fly casting with a #10 original Hornberg pattern. When the "Hex" hatch is on be sure you have a good selection of large mayfly patterns on hand. Try top-water lures in the "Grave Yard." Don't pass up shaded dock areas during the mid-day hours. Fly-cast a #8 Muddler Minnow and also a furry mouse made with cropped deer body hair. 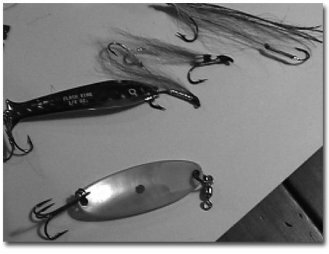 Focus on fishing areas of the lake that have "structure", but use weedless lures. Concentrate on casting in between lily pad areas. Jigging a Swedish Pimple at varying depths can be very productive. Use live smelt with a very small non-lead weight. Keep your equipment well maintained and organized. An 8" power auger is all you need for any fish in Lake Winnipesaukee. Set traps at varying depths until you locate the optimum fishing depth. Catch & release for landlocked salmon? I ordinarily keep 3 or 4 landlocked salmon at the beginning of the season so we can have one big family dinner of baked Winnipesaukee salmon. After that most all the salmon are released to fight another day. A fish is much more valuable as it fights on the other end of a line than it is lying dead in a frying pan. What do I think has happened to the New Hampshire Lake Winni Yellow Perch? It appears to me that the average size of yellow perch has dropped off significantly over the past 15 or 20 years, but the quantity seems to be holding its own. I often rely on yellow perch to introduce my grandchildren to the very basics of fishing. We have found plenty of "takers" at the marinas we've visited. Usually when a species declines in either numbers or in average size the cause is related to a reduced food supply. One reason for a species' food supply to drop involves a more intense competition for that food by one or more other species. For instance, we know that Winnipesaukee's bass and white perch population is doing very well right now. This certainly could partially explain why other species such as the yellow perch would be affected. There are, of course, a myriad of other possible causes also that could include disease, parasites, water pollution, and/or reduction of suitable habitat. If I were Commissioner of New Hampshire Fish & Game, what initiatives would I take? After conducting research on the current smelt population in Lake Winnipesaukee, a program should be implemented to upgrade the population. This is being done, but it is vital to have more resources for this work). Figure out how to effectively control the growth of Milfoil in the lake. Push for reasonable limits for the types and numbers of gasoline engines and a speed limit on the lake. Establish a section or two of the lake for "no kill" fly fishing for landlocked salmon, and perhaps even for bass too. That would stir things up a bit. Push for limiting the use of "personal water crafts" in the more ecologically sensitive coves of the lake. "Under the Cover of Darkness"
Back in the 1960s it was an opening day tradition for my good friend and mentor, Marty Harwood, and I to put our little 12-foot aluminum boat in at the Opechee Trading Post and fish the Winnipesaukee River just above the Messer Street Bridge in Laconia, New Hampshire. By starting as early as 4 AM we could fit in a good two hours of great fly fishing before the start of school, which for both of us was just a couple of blocks away from our launch point. In those days the landlocked salmon population in the river through the center of Laconia, New Hampshire was very impressive, (as it was this spring). There was no shortage of fishermen either. The abundance of landlocked salmon in the river drew fishermen in from all over the northeast. The natives, especially the younger ones, were also out in sizeable numbers on April 1st. They would be lined up on the bridges in town well before daylight - a virtual maze of lines, bobbers, smelt, and lures dangling over the bridge railings. As Principal and Vice Principal at Memorial Junior High School, Marty and I were seen as avid fishermen by many of our students who also ventured out at 4 AM on opening day. There was not a hint of daylight as we eased our boat into the frigid water near the dock owned by Mert and Barbara Cotton; and who had already given us a jump-start with a hot cup of coffee. As usual, the anticipation of some fly fishing action with one or two of the Winnipesaukee "landlocked salmon" was running in high gear. Our plan was to move out and upstream from the dock area and anchor in what we had come to regard as a "hot spot" for fly-casting. After we got there and the word had been given to drop anchor we each waited for the familiar tug of it as it found a holding spot on the bottom. It quickly dawned on us, though, that we were free floating in the rather strong current directly toward the bridge and that maze of fishing lines that were hanging from the bridge. Each of us had "assumed" that the other guy had actually thought to tie the anchor to the boat. We were now rapidly drifting helplessly broadside, in the darkness, right into all those lines! It all happened very quickly and before we knew it we found ourselves well below the bridge and luckily able to avoid a very dangerous situation considering the temperature, depth, and swiftness of the water. Needless to say, we had caused a considerable uproar on the bridge as many of the lines were taken out by our boat as we traveled under the bridge. We heard more than a few negative references to our basic intelligence and common sense abilities. We floated well down river - away from sight of the angry anglers on the bridge before we decided to row to shore and end our landlocked salmon fishing expedition for the morning. I will always be able to re-create in my mind the image of Marty trying to untangle a large red and white bobber that had attached itself to one of the guides of his fly rod. 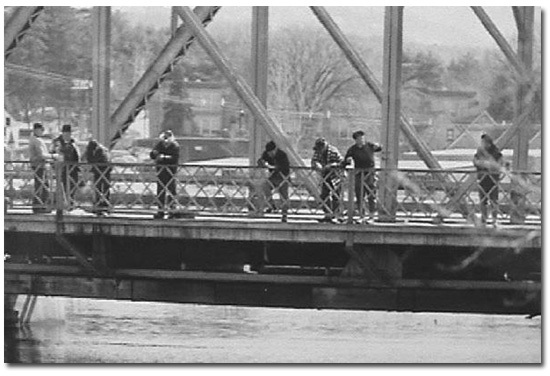 Later in school that day we each overheard several versions of the story about the two "knuckle-heads" that caused havoc on the Messer Street Bridge. Marty and I were thankful for the cover of darkness that served to conceal our identity that cold April morning. "An Unexpected Landlocked Salmon Bonanza"
It was late April on Lake Winnipesaukee, New Hampshire and the ice had been out for approximately a week. My ten-year old daughter, Dianne, and I had already clocked in more than six hours of plying the waters in the Saunders Bay area. After minimal success we decided to troll back in to Glendale via the Broads side of Locke's Island. The weather was perfect for early season boating - bright, sunny, calm, and warming up rapidly. It certainly was not what most landlocked salmon fishermen would call prime fishing time or conditions. We were trolling 3 sinking fly lines, each sporting a different tandem fly pattern; a beaded Gray Ghost, a Pine River, and a Red & White. As we slowly cruised past the pair of blacktop buoys, 2 of the Pflueger medalists "sang out" simultaneously; a "double!" We managed to lose one of the eager landlocked salmon due to a little confusion with handling of 3 rods. But Dianne was as proud as could be after successfully landing a beautiful 3-pound landlocked salmon. It wasn't long before we were traveling back through the same "hot spot." It was then my turn to bring in another fish of comparable size. This was the second hit on the old beaten up Red & White that we were using. But this was only the beginning of our unexpected bonanza. Between the hours of 11 AM and 1 PM Dianne and I were each able to bring in three landlocked salmon, each one in the three-pound, 22-inch size range. The old beaten up Red & White tandem fly was the fish's choice in 6 of 7 hits. When we finally decided to call it quits for the day that "super" fly was almost totally destroyed. The silver tinsel was a tangled mess and there were less than a dozen sprigs of red and white buck tail remaining intact. We returned 4 of the landlocked salmon to the water and were able to provide a big feed for our family with the remaining 2. This is an experience that Dianne and I have regularly been able to reflect upon with great joy even though it took place almost 30 years ago. It certainly made me alter some of my theories about ideal conditions for landlocked salmon fishing. I still have that Red & White and have "ruined" a good many additional ones over the years in the waters of Winnipesaukee. 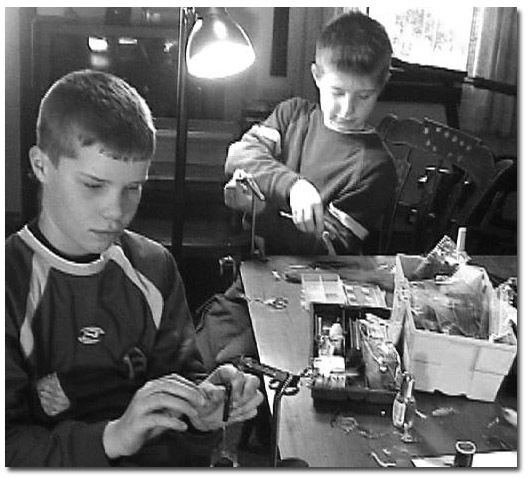 Now Dianne's sons (my grandsons) have learned to tie their own flies at a young age. "The Guide Learns A Valuable Lesson"
He was one of my first clients during the years I was a New Hampshire fishing guide. It was late in the month of May when I contracted with an older gentleman from Massachusetts to spend a day in New Hampshire on Lake Winnipesaukee stalking the sometimes-elusive landlocked salmon. During the events of the day, this person would show me that he was the epitome of the patient and forgiving man. We had trolled in the Melvin Bay section of the lake for more than four hours with only one short hit. My client had had some experience with landlocked salmon fishing several years beforehand so he was very understanding about the chances of having a non-productive day of fishing. However, he exhibited un-swerving optimism about our prospects for the remainder of the day. It was early afternoon when we connected with what appeared to be a three to four-pound landlocked salmon. My client proved to be quite adept at playing the fish as it tail-walked on the surface on several occasions in its attempt to go free. I was successful in bringing in the first of the two remaining vacant lines. And when more than half of the second line was in, the "prize" fish that was being played by my client made a strong run directly over the line I was retrieving. The fish then reversed direction and crossed the line again. When the vacant line reached the gunwale, it was obvious that it might interfere with the landing of the fish. I wanted to be sure that it would not happen so I hurriedly reached for my clippers in order to free up the "live" line. The fish was now near the boat and at the surface; a beautiful sight, indeed. The fish was still very active and was capable of several more short runs. I was more than willing to sacrifice a leader and a Gray Ghost to ensure my client's chances for success. As I clipped the leader in front of me I breathed a sigh of relief, until....... it became terribly obvious that I had cut the wrong leader! That sinking feeling I experienced as we watched the silvery form disappear below the surface will be forever etched in my memory bank. I don't know how many times I apologized for my stupidity to this fine gentleman but it was quickly obvious he was above it all and was able to demonstrate immeasurable patience and understanding with his young guide. I think he probably felt as badly for me as I did for him. Luckily in the remaining daylight hours we were able to give him two more opportunities to land a Winnipesaukee landlocked salmon. He was successful both times and we parted at the end of the day, each with very positive feelings. I'll never forget the lessons this man taught me that day "under the Smile of the Great Spirit."